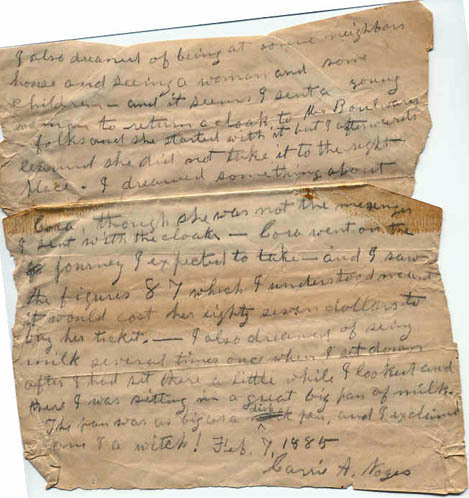 Nancy Benton, who had this in her collection, notes Caroline Atwell Noyes (line of the blog’s author) had cut apart an envelope that had contained a letter addressed to herself and written this dream on the inside. The dream concerns her daughter Cora going on a trip, and the numbers 87. 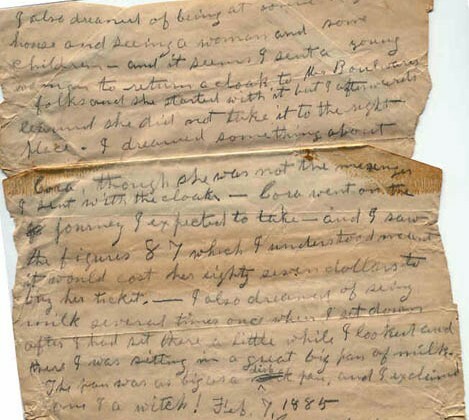 It was a powerful dream for her, else she’d not have kept this scrap of paper. Why it was kept throughout her life, and after her death, I expect, was due the fact that on Oct 16, 1887 Cora died bearing her first and only child, Robert Greene Harmon, who survived and was raised by his aunt and uncle. The dream may have also been powerful to her due the fact she wonders in it if she is a witch. The line of Carrie’s husband, James Allen Noyes, was connected with the Salem witchcraft trials. Timothy Noyes, an ancestor, had a brother who was a clergyman witnessing at least four of the hangings, Rev’d. Nicholas Noyes, and was said to have been cursed. Wikipedia and other sources note that in folklore, witch’s milk, that taken from the breast of a newborn infant, was believed to be a source of nourishment for witches’ familiar spirits. Caroline may have been aware of this lore, which would have made even stronger for her a sense of prognostication of Cora’s dying in childbirth.